I looove crepes. I have crepes in Toronto all the time for dessert, and every so often I would go to Apricot Tree in 'sauga for some savoury crepes, and I have also been to Le Papillon in downtown. However, I knew I wanted to go to a crepe place in Montreal (i.e. one that is known for their crepes), and preferably located in Old Montreal, and preferably with a patio with a nice / romantic atmosphere haha. And just my luck, I found all my requirements at Jardin Nelson. It has a lovely courtyard, with trees and plants surrounding the place, and has jazz music playing in the background at all times. Like its website says, it is "a small and comfortable oasis where the summer breeze is always present", and I cannot agree more. 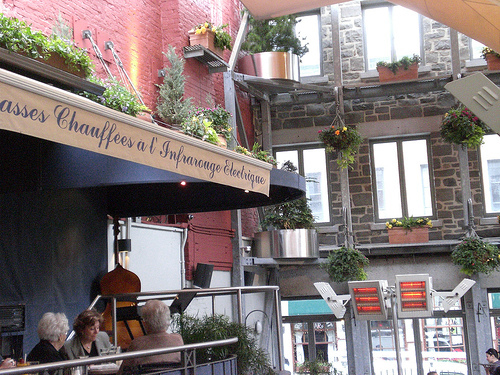 Their courtyard's plant design was purposely matched with the restaurant's architecture, which dates back to 1812. Different kinds of jazz music is played depending on whether its noon time, afternoon, or evening, and also changes depending on whether its a weekday or a weekend. Their huge parasols are unique to in Quebec; they allow customers to finish their meals if it starts to rain. They also claim that they have the "state-of-the-art" heating system - thankfully I didn't need to verify that because the weather was absolutely gorgeous that day. Here's a shot where you can see a bit of their "state-of-the-art"
heating lamps at the bottom right. Without further ado, let's get on with food! Here's the crepe part of the menu. They also serve salad and pizza, but no way am I gonna order that here! I ordered the "Saddle of rabbit" crepe and my boyfriend ordered the "Veal blanquette" crepe. I was torn between the "Saddle of rabbit" and the "Confit of Brome Lake duck filets" for the longest time...but figured I hardly get to eat rabbit in Toronto. ...and as usual, my boyfriend ordered beer. He ordered this beer called "Maudite" which is like 8%...quite strong. Our bread came shortly after...again they gave us a lot of butter (the breads were covering some of the extra butter). We ordered the "Breaded and Baked Calamari Strips" as appetizer. You're probably wondering, "baked"? Not "fried"? How good can that be? Well it was really good...you wouldv'e never guessed that it's baked because they were still very crispy and was breaded just the right amount (i.e. not too thick), and the seasoning on it was so tasty! The seafood sauce was a great compliment to it too. On to the crepe! I only took one crepe picture because my boyfriend's crepe looked exactly like mine from the outside. All the crepes come with a light and refreshing side salad, with an Asian style dressing (I know that sounds so general and generic...but I really can't describe what kind of dressing it is). in a white wine, mustard, and cream sauce. I know it doesn't look too appealing opened up like that. But trust me when I say that it is good! Rabbit already has a pretty unique taste compared to other meats and with it cut into little pieces like that, along with the two kinds of melted cheese and my favorite mushrooms blended all together inside the warm crepe, it was really delicious. And the sauce was divine - the wine and mustard cream sauce provided a strong, almost tangy, taste to the whole crepe that I think tied the whole combination of ingredients in the crepe really well. I was really happy with Jardin Nelson. I know there may be other better crepe places in Montreal, but I was genuinely so happy and satisfied with my experience at Jardin Nelson because 1) I was on vacation 2) I was on vacation with my boyfriend, 3) the weather was superb (sunny with a light breeze), 4) I was sitting in a big courtyard with beautiful decor and plants around me, 5) I was leisurely sipping on my favorite drink with no rush to go anywhere afterwards, and 6) jazz music was playing in the background. So even if my crepe is not the best in Montreal, I cannot ask for a more perfect and happier time.